Albert van der Sel : Basic arithmetic/calculus. Maybe you need to learn basic "arithmetic" rather quickly. So really..., my emphasis here is on "rather quickly". So..., I am really not sure of it, but I hope that this note can be of use. I assume you have a certain basis, like that you are able to add and subtract numbers. 1. Use of parenthesis "(" and ")" in arithmetic. Arithmetic is in a way based on (sort of) natural order and observations, but also on a set of rules. That's really true. People all around the world have agreed to use certain "practices". One of them is the use of parenthesis, that is the "(" and ")" symbols, in formula's and calculations. So, as a rule, calculate what is in parenthesis first. the order is not really relevant. That is 3 + (4 + 5) is the same as (3 + 4) + 5, since (3 + 4) + 5 = 7 + 5 = 12. So, again, we find "12" as the solution. You don't need to know how this is done right now, but for now, just follow the same rule with respect to parenthesis. Now, if you wonder about the "order" on how to handle the subterms, then that's good thinking. enclosed in "(" and ")" (namely 7 + 3), and we see that we need to "divide" (7 + 3) by 2. So, what's the order of calculation in equations like that? Let's go to section 2. 2. The main order in arithmetic. 3 x 4 + 8 = ? do we add first and then multiply? Is the answer 12 + 8 = 20, or is the answer 3 x 12 = 36? Well, mulitiplication goes before addition. 3 x (4 + 8) = ? (1) Between parenthesis first, (2) then Multiplication, (3) then Division, (4) then addition or subtraction. (There is one missing actually, and that's "to the power of", which we will see later on). This is because now we have (3+5) in parenthesis, so that must be calculated first. If you would see these numbers, like 1, 7, 256 etc.. it all sounds really "normal". At first sight it may seem rather strange, but it's not really. A few examples may illustrate that. In physics we know that the electron has a (sort of) "negative" charge (electricity). and the result is that the atom now misses one "-" electric charge, and thus the atom is now "+1" or simply notated as "1". (note: electric charges are normalized here). So indeed, positive and negative results, captured in numbers, really exist. in that plane. Take a look at the figure below. You see two axis, the horizontal one called "x axis", while the vertical one is called the "y axis". The intersection of those axes, is called the "origin" (just a name for it). Now, when you start from the origin, you can go 5 steps to the right. You are then at "x = 5". However, from that point, you can take 7 steps to the left, which puts you at "x = - 2" (note the "-" sign). I think you can find nummerous examples by yourself. but in such a case, "+" are usually not "written" down. You can visualize such calculations, if you perform steps to the right or left, on the x-axis, starting from the origin. a - b: first do "a" steps to the "right", then "b" steps to the left. a + b: first do "a" steps to the "right", then "b" steps to the right. -a + b: first do "a" steps to the "left", then "b" steps to the right. -a - b: first do "a" steps to the "left", then "b" steps to the left. If you have 1000 euro's on your bankaccount, but you withdraw 2000 euro's, your saldo now is -1000 euro's. Well, I hope I was able to illustrate the usability and neccessity of "negative numbers". never done. When a number is positive, the "plus" is almost always simply left out. It's taken for granted that it is there. I think many will need some time to 'adopt' the way to add/subtract negative numbers. If we want to subtract -3 from -9, the answer is -12. 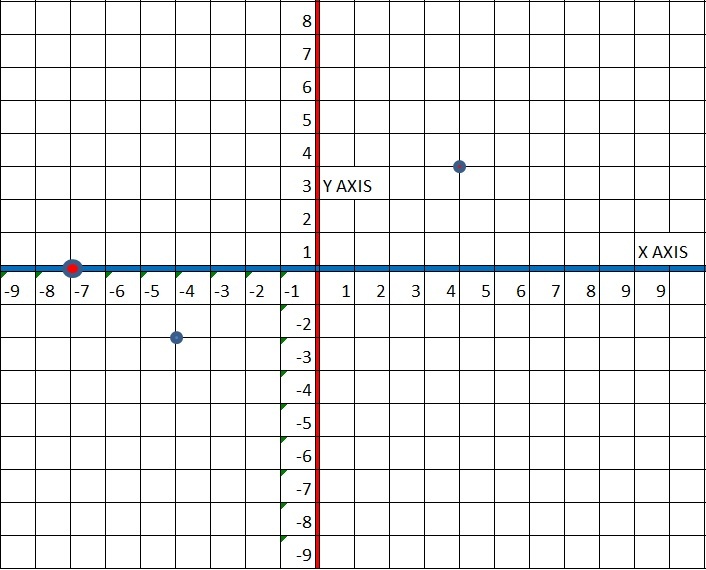 If you take the analogy of the coordinate system, then at start you 'were' at position -9 at the x-axis. Now, you go 3 more steps to the left (-3). So you end up at '-12'. - Example 1: "-3 -7 + 4"
It might be read as: from the origin, we take 3 steps to the left, then 7 steps to the left. This places us at -10 (or x=-10). From that position, take 4 steps to the right (going in the positive direction), which places us at -6 (or x=-6). - Example 2: "3 x -7"
Using positive numbers, we know that 3 x 7 = 21. You may also read it as: from the origin, take "3 times 7" steps to the right. This puts us at 21 (or x=21). Now, 3 x -7 may also be read as: from the origin, take "3 times 7" steps to the left (the negative direction). This will put us at -21 (or x=-21). This may be read as: take 3 times 7 steps to the left, then, take 3 time 7 steps to the right. The result is "0". You may wonder about how we write things here. take one step to the left, then, take another step to the left. When you are only adding and/or subtracting numbers, you can choose your own ordering of subcalculations. At a certain moment, you get used to it, and you don't visualize "steps" anymore (if you ever did anyway...). For example, the number 3.14 (e.g. used in the USA) or 3,14 (used in most of Europe), is not a "whole" number (or integer). are called "integers" and they do not have a fractional component. Such a fraction behind the 'dot' (or 'comma'), is smaller than 1. For example, the number 3.14 is exactly 0.14 larger than the whole number 3. And it is 0.86 smaller than 4.
while in other countries, folks uses "." (a dot) to specify fractions. you know that people uses a "dot". But if you were in The Netherlands, folks use a "comma". If a number is not a whole number, it has a certain fractional part which is smaller than "1". which the part of the number which is smaller than 1. In a countrly like The Netherlands, I would have used a comma. if you would take the "," instead. and other classifications go around too. That's not of interest to us, for now. Now, let's calculate with "real numbers" ! Below I will use a dot to denote the fractional part in the number. In your country, it maybe a comma instead. If so, then nothing fundamentally changes ofcourse. One "trick" that you may use, is that you just add the whole numbers seperately, and the fractions behind the dots seperately. But what if the addition of the fractions are larger than "1"? The fractions 0.45 + 0.85 add up to 1.30 (1.30 = 1 + 0.3). So, this "1" has to be added to the sum of the whole numbers. What do you think is the outcome of this: 7.03 + 8.006? Next, let's see how this all works with multiplications. to give a more complete "picture". But first, I like to illustrate two important theorems from calculus. 5. A few important theorems. Suppose A, B, and C, are some arbitrary numbers. So, they litterally can be any number. So here we first calculated (2 + 8) and then multiplied 10 by 5. So here, the answer is 50 too. Is this in conflict with section 1? There I told you that a calculation between "(" and ")"
By the way: We will see plenty examples soon, where it is shown that calculating stuff between "(" and ")"
is indeed really critical, to perform first. So here we first calculated (8 - 2) and then multiplied 6 by 5. 5 x (8 - 2) = 5 x 8 - 5 x 2 = 40 - 10 = 30. Here, the answer is 30 too. This can be a handy theorem. However, sometimes the "otherway around" maybe helpful too ! It's a bit "otherway around", since we started out with "6 x 335" and we rewrote it to "6 x (300 + 30 + 5)". 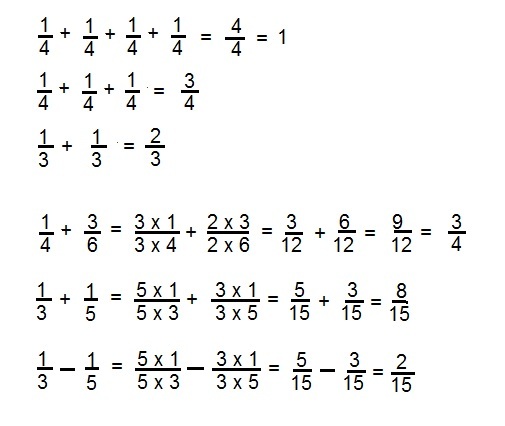 If you have any calculation where a division is part of, then the following may help enormously. then you may multiply the top number (A, the nominator), and the number below (B, the denominator), by the same number (C). By the way, there are different ways to "notate" fractions. Sometimes we see a notation like "A / B"
We find the same results ! In the next section, we will explore "fractions" a bit more, like how to add fractions etc..
First, a few obvious statements. When you split "something" (like 1), in 4 equal pieces, each piece is 1/4 of the original amount. When you split "something" (like 1), in 5 equal pieces, each piece is 1/5 of the original amount. When you split "something" (like 1), in 3 equal pieces, each piece is 1/3 of the original amount. Remember, there are different ways to "notate" fractions. Sometimes we see a notation like "A / B"
or on the rightside of the "/" symbol if we use the "A / B" notation). To accomplish that sort of calculations, we rely heavily on "Theorem 2" of the former section. If needed, re-read Theorem 2 again from the former section. In figure 2, we will take the 4th calculation as an example. We know that it is easy to add fractions which have the same denominator. So, let's rewrite 1/4 and 3/6 to be fractions in form "x/12", thus with "12" as the denominator. of any fraction, with the same number. So, we muliply the top- and bottom numbers of 1/4, with "3". This gives us 3/12. And, we muliply the top- and bottom numbers of 3/6, with "2". This gives us 6/12. Ofcourse, 9/12 is the same as 3/4, and it's quite neat to promote that result as the outcome of our calculation. By the way, did you noticed that "3/6" is the same as 1/2? And that is the same as "2/4". So, it was actually quite easy to add 1/4 with 3/6, because it's the same as 1/4 + 2/4 = 3/4. Now, please try to follow the 5th calculation of figure 2, all by yourself. 7. Square numbers, and "to the power of...". This is real easy. Namely, how to square numbers, and calculate "the power of" some number. You know that 3 x 3 = 9. I can keep going on providing examples, like 4 x 4 (=16), or 9 x 9 (=81). If you multiply a number, by itself, it's called taking the "square of". We also have a simple notation for it. You simply put a "2" above it. is just a shorthand for "A x A". In these examples, we take the "power of 3" of such a number. In these examples, we take the "power of 6" of such a number. 8. Arithmetic using negative numbers revisited. I like to be sure that you can handle negative numbers alright. I think that you are comfortable with the following types of calculations. 7 - 9 = -2 (note the "-" sign). then do 9 steps to the left (- direction), which will put you in x = -2. -2 - 3 = -5 (note the "-" sign). then do 3 steps to the left again (- direction), which will put you in x = -5.
which places you at x = -2.
which places you at x = -5. Both ways to view matters, will work at all additions or subtractions. In fact they are the same anyway. 5 x 5 = 25 "=Take 5 times, 5 steps to the right (from the Origin). That's 25". 5 x -5 = -5 "=Take 5 times, 5 steps to the left (from the Origin). That's -25". As the last example we must explain that for example "-5 x -5 = 25", thus resulting in a positve number. -5 x -5 = -( 5 x -5) = -(-25) meaning, take the opposite of 25 steps to the left, which is 25 steps to the right. Bottom line: please remember that (a negative number) x (a negative number) = positive. This can be important for my next notes. 9. The "square root" of a number. Here, we are only concerned about "taking the power of 2". Doing exactly the opposite, is called taking "the square root of a number". So, suppose we have the number 25. What is "the square root of 25"? Note that we use the "√" symbol, to designate that we want to calculate the square root. Suppose we have the number 16. What is the square root of 16? It's √16 = 4. This is so because 4 x 4 = 16. So, √16 = 4. Calculating the square root of for example 39.5, or for example 6.3, is not easy, for nobody. That's why we have calculators! But for "easy" numbers, it's not too hard. So, the square root of 64, written as √64, is 8. Yes, when multiplying numbers, of which each is raised to some power, then simply add those powers. Let "y" be any number. is then somewhat unhandy. So, often, "x" will be in another font, or characterset is used. Or, the multiplication symbol "is simply left out", and the multiplication is implicitly assumed. 11. Some further remarks on working with roots. We know that, for example, √16=4, since 42=16. we knew that 4x4=16. Thus √16=4. However, √5, or √71, are not immediately solvable, unless you have a calculator. Ofcourse, √5, is a little more than "2", but less than "3", since 22=4 and 32=9. So, in tasks, or homework, in math, you most often do not have to calculate √5 any further. Now, we must further learn how to deal with larger expressions involving roots. For example, how can we simplify an expression like "2√3 + 3√5 + 7√3"? So, in expresssions, where there are similar roots, then simply add (or subtract) them. the most compact expression, or that that you must end up with only one term with a root. Sometimes, the task is to reduce an expression, to have one sort of root, only. It looks like as if we cannot "lump" together similar roots. But, in this case, we will use a rule, that we will study in the next subsection. You need to know (see below), that actually √27 is equivalent to √(3x9). But √3 x √3 = (√3)2 =3. So, in this example, √ab = √a √b is true too. Also note that √a √a = a. Indeed, in (√a)2, then the "square root"
and "taking the square", cancel out. The basic rule is √(a:b) = √a : √b. 12. Optional: Introduction of some mathematical symbols. then this material is not so important for you. If you like to go through my next notes, then it would be great if you would browse through the table below. The examples below, use, for example, '0' and '5' as some "markerpoint", but it can ofcourse be any number. which can be of great help to "label", or "indicate", certain ranges. and is a super quick intro in "linear equations".